1. Visit the neighbourhood on foot. Take a walk through the neighbourhood and talk to people. Drive by at 7:30 in the morning to see how many school buses are picking up children. You can also tell how long it may take you to commute to work during rush hour. By speaking to people, you can not only get a sense of the friendliness of the community, but also as to whether there are any surprises that no one is going to advertise, a local haunted house, vandalism, former grow houses, or the neighbour from hell. Visit your local building department and find out if any new developments are planned. New development may increase property values but also increase traffic. 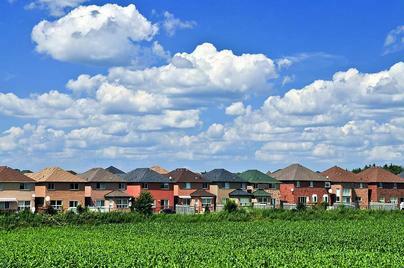 Check to see how many owners have applied for minor variances, to either build homes or additions that are larger than the by-law permits. This gives an indication of the future direction of this neighbourhood. Start by asking family and friends. Look for signs in the area that interest you, especially “Sold” signs. This is a good indication that the agent has the area’s pulse and knows what a home should sell for. They should also likely be aware of any problems, such as sewage backups, termites or vandalism; things that may only be known by locals. Also check the website of any agents that you may interview. Do they offer tips and explain what services they provide? Do they offer information about the neighbourhood including parks, religious institutions, demographics and schools? Ask about their success rate with bidding wars and do they know how to approach sellers who refuse to pay commission? 4. How much can you afford? 6. Why a survey is important A survey will reveal all boundary issues in advance, which will ensure that you do not have problems after closing, especially if you plan on making additions or other improvements. The home inspection is a critical part of the process, so do your research. Make sure the company is registered before retaining them. The Ontario Association of Home Inspectors is a self-regulating body that defines qualifications for home inspectors, and grants the designation RHI, or Registered Home Inspector, to qualified practitioners in Ontario. Most inspection firms have a limitation of liability clause, which states that if they miss something that costs you money, they are not responsible. Ask the company if they have ever been sued by a buyer. Ask the sellers if they have had basement flooding problems, or mould or roof leaks, even if the leaks have been repaired. Watch how they answer. Most sellers will now refuse to sign property disclosure statements, but they are required to respond truthfully to these questions if you ask them directly. If the seller refuses to answer or acts suspiciously, then you need to discuss this with your home inspector and your real estate agent and either adjust your purchase offer or walk away. If the home contains a basement apartment and the income is important to you, make sure that it legally complies with zoning and the fire code by-laws. If it doesn’t, then all it takes is one complaint from a neighbour and you may be forced to spend thousands of dollars to make it comply after you buy. Find an insurance agent right away and if possible, check what it will cost to obtain insurance as soon as you sign your agreement and before you waive any conditions. An insurance agent can check the history of claims in the neighbourhood and can let you know about claims for sewage back-ups or vandalism. This is important information that any buyer should have before deciding to waive their conditions and complete the deal. If you follow these simple steps and buy with your head instead of your heart, chances are you’ll get the house you want at a price you can afford, with no unwanted surprises later. I agree with point 1. Having a good look around the neighborhood is an easy way to get an idea about the people that live there and if your lifestyle would be a good fit. I was so happy I got a good home inspector. Really know what was wrong with my potential home helped me to know what I was getting into. I bought the house anyhow, even with a laundry list of repairs. But with my laundry list, I could tell the real price of my home. That was important! Excellent advice for homebuyers. Checking the neighborhood and getting a good inspection are the two key points for me. You should check the neighborhood several times, on different days and times. What could seem like a quiet street on Wednesday might have a huge amount of loud traffic on Saturday. I could not have said it better myself …. good advice!! I never thought of checking with City Hall. This is great advice. I also do what Serena recommends, but add in checking it out in the evening hours. The activity at night can greatly change compared to what you see during the day. It also gives you a chance to stop and talk to people in the neighborhood that are most likely working during the day. Wow! Great article. I will be looking into purchasing a house in about a year. I like what you said about zoning policies and laws. The reason is because I was considering a mobile park home to start. I know there are a lot of rules around this. I want to make sure I own the land that my house will be built on. I just wanted to add that I feel that if you are going to buy a house, as this article stated, it’s important to go with someone who has already successfully bought a house before, and have them refer and inspector to you. I have referenced this many times before …. select a professional, full time agent. Check them out …. they will have a website with TESTIMONIALS. This will most likely be the biggest purchase of your lives together AND your biggest investment. One that does not attract TAXES on the CAPITAL GAINS of your PRINCIPLE RESIDENCE in Canada!! I have always told my clients, why rent if you can buy a condo or home?? Afterall you are just paying the landlords payments on his – her investment!! This is a great list for someone like me – a potential home buyer who has no idea where to begin the search! I am currently working on a list of features that I really want in our home. I know that no home will be ideal, but I hope that having a list of features and coming up with some way to prioritize them will surely help my husband and I – and our real estate agent – out when it comes time to start looking for homes! Checking into home insurance and mortgage insurance is a great idea that I would not have considered before reading this post! We are always available to assist, as you require. Great tips! When I was house-hunting quite a few times in my life, I always asked the seller hard questions. Quite a few times I’ve gotten truthful, honest replies, other times BS stories. But it really does help to ask questions, never be hesitant to do so. I like it that you placed emphasis on buying a house with your head and not with your heart. Sometimes, we tend to lean towards our gut feel in making a decision. Although being comfortable with a particular house counts, you also need to be rational in evaluating your options. Look into several factors such as accessibility and price. Very comprehensive list of items. All important in the process. The neighborhood walk through is good advice. required in Canada? I heard of a case in the states where a bathroom wall competely fell in, because of termite damage. This was after completion of the sale. Not sure if a termite inspection had been done. Well when buying a home it is always critical do be sure that your “due diligence” covers all aspects of the homes integrity and valuation. Termites are a serious problem and it would amaze you were they have migrated to in the GTA for example. SO when concerned, always check with the local Pest Control offices to ascertain if the area you are considering has a history of termite infestation. There are reputable inspectors who specialize in testing for them. Also the little buggers do leave signs of entry and destruction but these can be hidden behind drywall and exterior decking. Great article. Definitely a lot of tips for the first-time home buyer. I agree with walking around the neighbourhood. You want to know who your neighbours are and what kind of environment you’ll be living in each day. As you say buyers need to separate their hearts from what they really need in a home in essence, but buyers get very attached to properties for one reason or another and lose their entire perspective until too late, then the regrets begin. Too bad. Excellent set of points. These are great tips. Thank you as always. Tip # 2 — going City Hall to find out about any upcoming developments — is one that is completely new to me. It’s a fantastic idea. I have a friend who told me that when she and her family bought their house and its five acre property it was surrounded by horse farms. She described it as a beautiful, pastoral country setting. Within just a few years, she said a fifty-house development sprung up all around her property. She went from rural resident to suburban resident in a very short span of time, much to her family’s dismay. Perhaps the trip to City Hall might have spared them this unwanted transition!